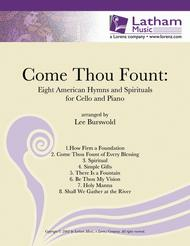 Come Thou Fount: Eight American Hymns and Spirituals for Cello and Piano composed by Lee Burswold. String ensemble. For cello and piano. How Firm a Foundation, Come Thou Fount of Every Blessing, Spiritual, Simple Gifts, There is a Fountain, Be Thou My Vision, Holy Manna and Shall We Gather at the River. Basic thumb position, tenor clef, some double stops. Grade 4. Published by Latham Music Enterprises (LA.730108).Uses thumb position, tenor clef, double stops.